This kid, I tell ya, he really does win the award for easiest kid during waking hours. Obviously, there would have to be such an award. But I may make one, just for him. He really is just so happy and content. Sure he likes playing with his toys, but he also likes watching life go by around him. And he especially likes it if I throw some food in front of him when he is sitting there. Speaking of sitting, the kid still isn't crawling. He can scoot around sitting up on our hardwood floors. But, he doesn't even get into the crawling position. In fact, on his belly, he seems to enjoy imitating a beached whale. He puts his arms and legs in the air and moves them around as fast as possible. I noticed him starting to try to stand when he can grab onto things that are low enough to help. Callum is still taking two stellar naps a day, as long as they aren't insanely messed up by the other kids schedules! He really is an amazing napper though. After a pretty bad rough patch, he is getting better at night sleep again. But, I have to admit, I found myself completely smitten at 5:25 on Saturday morning when he woke up oh-so-smiley. It was just me and him, smiling away at each other. Of course, the adorable moment only lasted a couple minutes before I made him go back to bed. But it really was a sweet moment, just the two of us. Size wise, Callum has moved into size 4 diapers. This has really helped me not have to get up and change him at night. So, awesome for that. 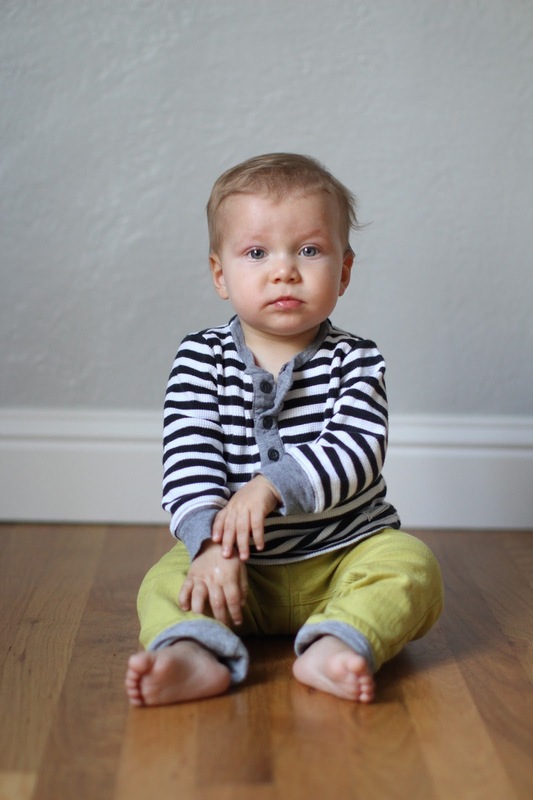 He has grown out of much of his 6-12 month clothing and is wearing a lot of 12-18 month. Though I have noticed the jump in pant length is a couple inches, so they are a decent amount long on him, but I am sure he will grow into them…and back out of them…before I know it. There is this adorable knit sweater that is 6-12 months that I started putting on him at like three months. I just rolled up the sleeves and all was good. It is getting snug on him and I am a little sad because I really liked it and he has been able to wear it for so long. But, I would much rather him growing than not! Callum really enjoys showers. He gets quite excited banging around at the water and will even turn his face up and let the water hit it. He also likes chilling in the cozy coupe car when I am making dinner. He really likes gnawing on books too. But I am guessing that is a side effect of teething. And anything he can bang together is alright in his book too. In a modern day parenting fail, I apparently did not write a 10 month update for Connor. Here's Isla's. From the sound of things, her drama (or "spice" as I now like to call it) started early. Maybe that means contentment will be one of Callum's personality traits. A mom can hope!